It's been a long time coming, but today Sony finally revealed the PS4 console, and with it a new generation of PlayStation controllers. The PS4 DualShock 4 controller features two sticks, four triggers, a directional pad, plus triangle, cross, circle, and square buttons, just like a classic PlayStation controller. But it also has a touchpad across its face, and a PlayStation Move-like "light bar" across the top. The start and select buttons have been moved to the sides to make room for the touchpad, and the DualShock 4 also features a "share" button next to the triggers and a 3.5mm headphone jack. The touchpad can be used for touch interactions and doubtless other processes that have yet to be revealed or imagined, while the color-changing light bar allows the controller to interact with the PS4's evolution of the PlayStation Eye, presumably for motion and pointing controls. Lead system architect Mark Cerny revealed that the DualShock 4 features improved rumble, reduced latency and some other performance improvements, and gamers critical of the older PlayStation controllers' convex control sticks will be happy to note that the DualShock 4 has concave sticks. The PlayStation controller hasn't changed much over the years, from the original PS1 DualShock to the PS3's Sixaxis and DualShock 3 controllers. The PS4's DualShock 4 controller is both a huge departure from that formula and more of the same. 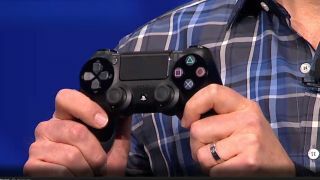 Thanks to all the rumors and leaks leading up to it, though, the PlayStation 4's DualShock 4 didn't exactly come as a surprise. Alex Evans, co-founder of LittleBigPlanet developer Media Molecule, later took the stage to discuss what his studio has been doing on the PlayStation 4. While he didn't show a new game, per se, he did show a creative tech demo in which players sculpted and controlled avatars using the PS3's PlayStation Move controller. While this revealed little about Media Molecule's plans for the PS4, it did reveal that the PS Move motion controller won't be made obsolete by the light bar on the DualShock 4 controller - in fact, the PS Move will be fully compatible with the PS4.